San Francisco, October 2016 – The San Francisco Symphony (SFS) celebrates the Latino community and its living heritage at its ninth annual Día de los Muertos (Day of the Dead) Community Concerts on Saturday, November 5 at 2pm and 8pm in Davies Symphony Hall. 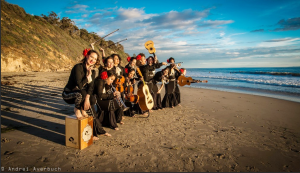 On-stage performers include La Santa Cecilia from Los Angeles, the all-female Mariachi Flor de Toloache from New York, the women of the San Francisco Symphony Chorus in a selection of Mexican folk songs, and Bay Area theater group Casa Círculo Cultural. Festive Día de los Muertos activities for all ages, including art installations, dancing, arts and crafts, and complimentary food and beverages take place 75 minutes prior to both performances. 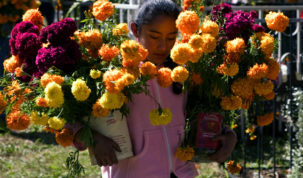 The San Francisco Symphony’s yearly Día de los Muertos event offers a multidimensional immersion in the vibrant cultural traditions of the holiday, marked annually in Mexico and throughout Latin America to remember and celebrate the lives of those who have died. This year’s performances are headlined by the Los Angeles-based group La Santa Cecilia. 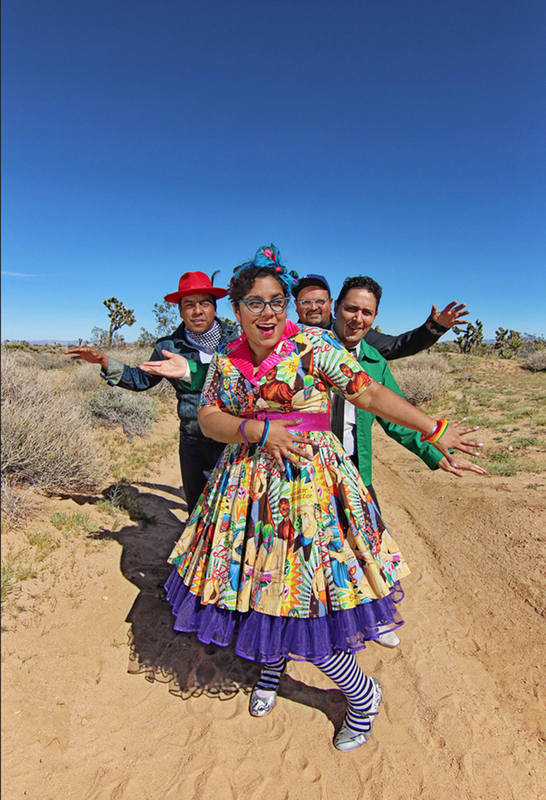 Accompanied for these concerts by a 10-piece string section performing new arrangements of their music, La Santa Cecilia incorporates dance-friendly rhythms ranging from cumbia, bossa nova, tango, bolero, jazz, rock, and klezmer music. 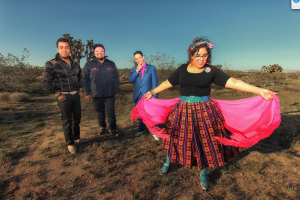 The band cites influences as broad as Janis Joplin, Led Zeppelin, Mercedes Sosa, and Ramon Ayala. 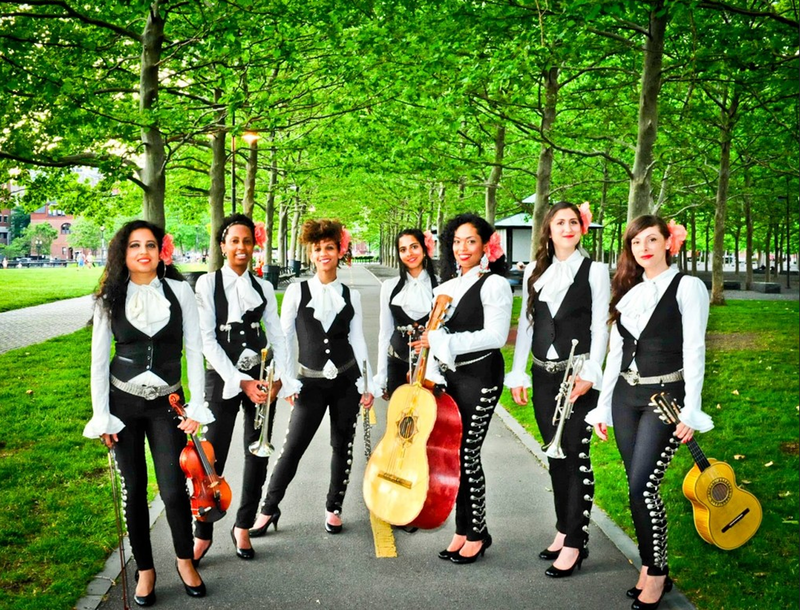 The barrier-breaking, all-female mariachi group Mariachi Flor de Toloache performs on the first half of the concerts, giving audiences a taste of its unique mélange of modern and traditional mariachi. The diverse cultural backgrounds of the women in the group infuse its sound with influences from a sophisticated, worldwide spectrum of music. The women of the Grammy Award-winning San Francisco Symphony Chorus open the concert with a selection of Mexican folk songs, accompanied by dancers from Casa Círculo Cultural. 75 minutes before each concert, the Día de los Muertos celebrations start in the colorfully decorated Davies Symphony Hall lobbies. Families and children can roam through original art installations and altars built by local artists to honor the dead. Guests are invited to bring objects, photos, and offerings to contribute to the two community altars. Children and families will also be able to decorate and take home candy sugar skulls, make papel picado, banners, and other arts and crafts. Musicians and dancers will provide additional entertainment in the lobbies, and complimentary pan de muerto and Mexican hot chocolate will be served. The Día de los Muertos Community Concerts are part of the San Francisco Symphony’s commitment to providing compelling musical experiences that celebrate the diversity of its community. 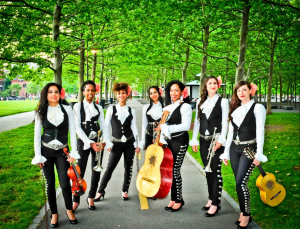 In response to the overwhelming success of previous Día de los Muertos concerts, in 2015 an 8pm performance was added to the festivities. An 11am brunch prior to the afternoon performance will be offered in the Wattis Room at Davies Symphony Hall as a fundraising event produced by the Symphony’s San Francisco League to support the Orchestra’s education and community programs. Brunch packages include a seated brunch with mimosas, sangria, and other Día de los Muertos surprises, followed by premium seating at the 2pm matinee concert. The brunch will conclude by 1pm so that guests may enjoy the pre-concert lobby activities. Brunch packages also include an invitation to a private tour of the Día de los Muertos altars with the altar artists on Tuesday, October 25, followed by a reception. Call the Volunteer Council for details at (415) 503-5500 and purchase tickets on the Symphony’s website at www.sfsymphony.org. Ticket exchanges and group discounts not available. Please note: The Orchestra of the San Francisco Symphony does not perform on these concerts. 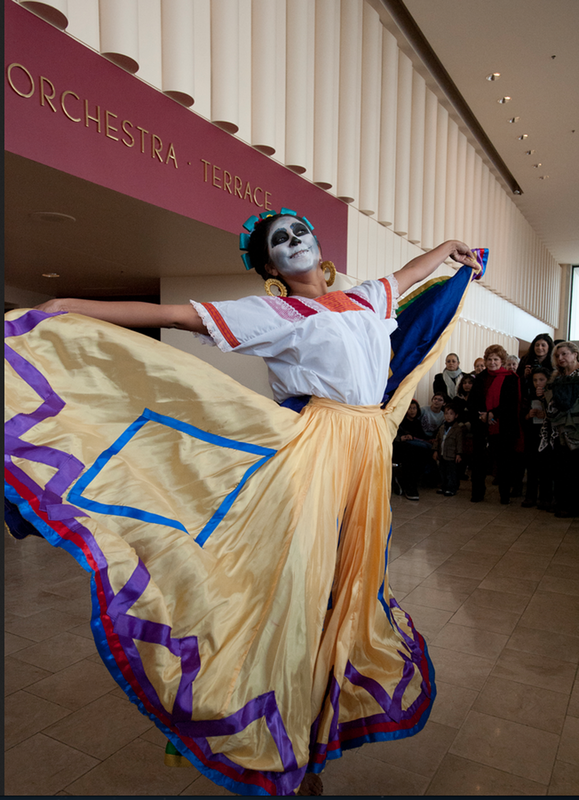 The San Francisco Symphony’s 2016 Día de los Muertos celebrations on Saturday, November 5 begin 75 minutes prior to each concert, when attendees are invited to participate in the rich Día de los Muertos traditions that are a significant part of San Francisco’s cultural life. Beginning at 12:45pm and 6:45pm, dance company Cuicacalli and Mariachi Juvenil la Misión from Buena Vista/Horace Mann Middle School will lead a procession outside of Davies Symphony Hall that incorporates traditional music and dance from various regions of Mexico, welcoming guests to the festivities. 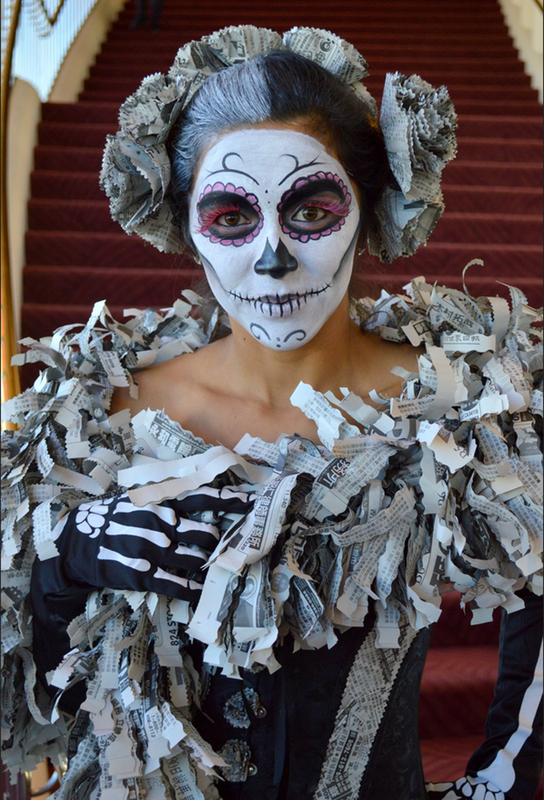 Inside the lobbies, members of Casa Círculo Cultural theater company, dressed as Catrinas and Catrines, the iconic figures of Día de los Muertos, will greet guests. Costumed in the Pachuco style from the 1950s, the Casa Círculo Cultural actors will also lead a procession into the concert hall to begin the performance. Casa Círculo Cultural will create enormous butterfly-winged skeletons to adorn the towering glass windows of the Davies Symphony Hall lobbies, drawing on the theme of immigration and the ancient legend and spiritual significance of the monarch butterfly, a symbol of rebirth and regeneration. Casa Círculo Cultural will also create a giant arch spanning Davies Symphony Hall’s grand stairway, anchored by two trees covered in monarch butterflies made by children. Artists from Creativity Explored, the San Francisco-based organization providing artistic opportunities for people with developmental disabilities, will create a gigantic transparent altar, and participants can write notes to the departed to attach to the altar. Prominent Bay Area artist Ester Hernandez will offer an installation honoring her grandmother, who emigrated during the Mexican Revolution and hid coins and bills inside the hems and ruffles of clothing, bedding, and curtains. 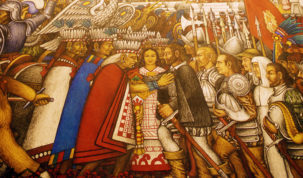 Other unique altars will include an installation by Adela Juarez, who will create an altar inspired by Santa Cecilia, the patron saint of musicians. A self-taught artist and second generation Mexican-American, Juarez worked as a farmworker along with her parents, both migrant farm workers living in the San Joaquin Valley. Sculptor and visual artist Viva Paredes will honor the 49 victims of the Orlando nightclub massacre, many of whom were Latino, with a commemorative altar. Sculptor Indira Urrutia’s altar will be in the shape of a teardrop, to which guests can attach paper flower petals. Sculptor and set designer Fernando Escartiz has created a paper maché skeleton holding a suitcase carrying more than clothes: the immigrant brings memories, music, culture, smells, and flavors from his homeland to contribute to his new country. Attendees are invited to bring photos or objects honoring their own deceased loved ones to place at the two community altars. Bilingual volunteers from San Francisco’s Mexican Museum will be present to explain the significance of each altar. 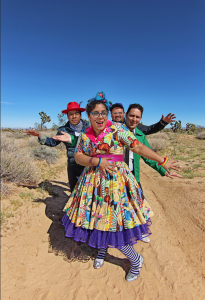 Bilingual lobby activities prior to both concerts include face painting, paper flower making, papel picado and skull banner making, and tortilla art making, organized by Children’s Activities Coordinator Indira Urrutia, and two photo booths by photographer Marc Hors. There will also be a sugar skull demonstration and decoration by Irma Ortiz. Dancers from Rueda con Ritmo will entertain guests and invite them to join in the celebrations. The Symphony Store in the main lobby will offer a Día de los Muertos pop-up shop during the event, partnering with Mari Arreola of Shop Spanglish. The shop will feature clothing, stickers, prints designed by Maldición, face tattoos, CDs, sugar skull kits, accessories, wine glasses, cook books, and more. Artist Adela Juarez will show and sell her original artwork. Beautiful Huichol skulls from the Mexican Museum will be available for purchase, as will author Mary Andrade’s books on the different Día de los Muertos traditions practiced throughout Mexico. Bring the entire family to a celebration of Día de los Muertos (Day of the Dead), with Los Angeles’s Grammy Award-winning La Santa Cecilia, the all-female Mariachi Flor de Toloache from New York, the Bay Area’s own Casa Círculo Cultural theater group, and the Women of the San Francisco Symphony Chorus. 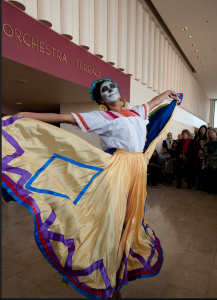 Entertainment and activities begin 75 minutes prior to each show, when the dramatic, light-filled Davies Symphony Hall lobbies will be decorated with Día de los Muertos altars designed and created by local artists, guests can make traditional and contemporary Día de los Muertos-related crafts, dancers and musicians will entertain the crowd, and free refreshments will be served.